Caption slip reads: "Photographer: Emery. Date" 1951-09-05. Reporter: Jack Stevens. Assignment: Douglas strike, Long Beach. 44, 45, 60: part of crowd of 8000 union members meeting in Long Beach Municipal Auditorium where they rejected Douglas' latest offer. 48, 49: Women pickets opposite Gate 1, on Lakewood Boulevard 10:55 am. 40, 41: Mrs. Adelle Mazzurco, 24 years, of 5609 Pennswood Ave., Long Beach, departmental clerk, picketing opposite Douglas main entrance on Lakewood Blvd. Her husband Tony, a spot-welder is walking a nearby line. The have 2 children. 46, 47: Long shots massed pickets on Lakewood Blvd. opposite plant. 54: Pickets at one of the two Carson Street entrances to Douglas plant -- 11:50 am. 137: Sheriff car and Deputies in front of one of the gates at the Douglas Long Beach plant. 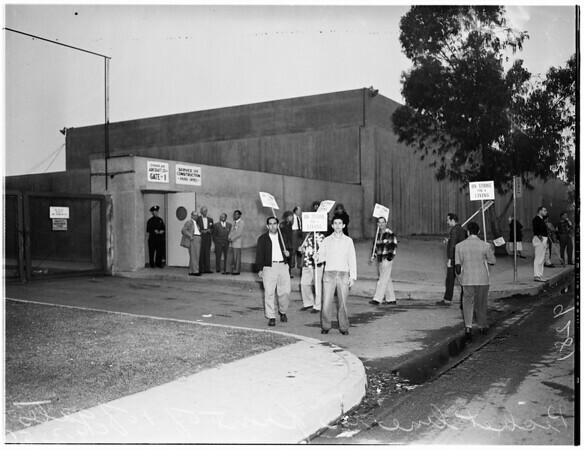 4, 3: Picket line in front of one of the gates at Douglas Long Beach Plant. 137: Betty Murphy (Picket Captain) passing out signs. 126, 127: Pickets across the street from the main entrance of the Douglas Long Beach Plant. 1: Pickets at gate to car parking area of the Douglas Long Beach Plant. 2: Car going through picket line in parking area".